I am trying to write, trying to work on my book today and I can’t. I can’t stop thinking about how many people have been impacted by this horrible storm. The news coverage is incessant. The city is now two cities: the people downtown, still in the dark and truly miserable and the people (me) uptown – generally unscathed but still tense and worried and still impacted by all going on: short tempers, long gas lines, family and friends without power, heat or patience. My mind kept wandering and I started thinking about ways to be helpful in some small way — any way — after the storm. I was also still mad that it took until 5 p.m. to cancel this Sunday’s Marathon. Hello? Were there really brains in a room, wasting energy, and discussing it? Earlier, a good friend of mine called, frustrated and exhausted. She is on her fourth day of no power and running around looking for a generator at every Home Depot in the tri-state area. “There is a Nor’easter coming next week,” she told me. “Yeah, right,” I said, thinking it was a rumor. “No, really. I just saw it on the news.” I Googled a little. She is right. There is some talk about a storm coming. What the &$%*? People are also talking about power in some areas not coming back for weeks. Why am I ranting on the 52 Weeks blog about the hurricane? Because I had to. Because I can’t concentrate right now on anything else. 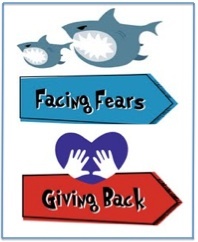 There are two chapters in our forthcoming book that seem right to talk about here: Facing Fears and Giving Back. Facing Fears is all about, well, facing fears and overcoming personal stuff – hurdles – that keep you from moving forward and perhaps avoiding situations (fear of flying, fear of commitment, fear of change, etc.). But what about other fears? I admit, when the winds were hitting my windows at 90 mph or more I was a little nervous. The post-storm response (or lack of) scares me too. How do people deal with fear and situations when you don’t have control? I am revisiting my notes on that chapter. The Giving Back chapter is all about the importance of finding a cause you feel passionate about or volunteering to “get going” again if you feel stuck. It’s simple and an old one: help others and you will feel better about yourself. I can’t think of a better time. Pam, my blog partner, called me yesterday and said we really should go out and help in some way. I agree. We are looking at the options; I know there is some way we can actually do something and feel better. All I can say is that right now I feel helpless and want to do something other than offer my shower to those without power and water. I am not, of course, immobilized like those sitting in gas lines or stuck without food, water or electricity. I just feel mentally stuck and mad at Hurricane Sandy and its impact on so many. I can’t sit and write at my desk right now with all the people out there that need help. And Bloomberg, I am glad you woke up and cancelled the Marathon. Maybe the runners who already arrived in NYC with their running shoes and carbohydrates will get stuck here and can actually volunteer – run around and pass out water perhaps? Maybe, just maybe, when I know people are a little calmer, I can get back to these chapters. For now, it’s just a big storm in my head. Write us if you are volunteering in any way. We want to hear from you. Stop making predictions aloud about how long someone may be without power. You basically have no idea. It doesn’t help anyone and annoys people, especially people without electricity. Don’t brag if you have electricity or a generator. Drop off some clothes anywhere, anyplace. It’s a great time to finally clean out your closets. It forced me to admit I don’t fit in many things in there anymore! Give someone a massage or just listen to someone complain. The shelter at Hunter College needs help. Hunter is housing about 200 displaced New Yorkers each day. They especially need volunteers for night and weekend shifts. Located at 695 Park Avenue (@68th Street). Call the shelter directly at 212-396-6741. You can also help by making care packages at the Food Bank. Volunteers are needed at their warehouse in the Bronx this weekend. The volunteer shifts are 10:30am-12:30pm and 1:30-3:30pm. The address is 355 Food Center Drive, Bronx, New York, 10474. It is accessible by a subway/bus combo: 6 train to Hunts Point, then Bx6 bus to the Hunts Point Market. UJA-Federation has opened the Hurricane Sandy Relief Fund with many opportunities to volunteer. Stay sane and let us know if you see any runners with nothing to do! I could not agree with you more!! Said perfectly!! Hi Karen, I can’t thank you enough for this post. I woke up this morning feeling the exact same way. I read your post on my iPhone while still in bed thinking about how lucky I am to have been unaffected by the storm–and how stuck I am because all my plans for the weekend (including the Marathon) were cancelled. I hadn’t yet done anything for the hurricane victims and that was gnawing at me as well. Where to begin? Within ten minutes after reading your words, I was set to help out at the Hunter College shelter tonight (they said they have plenty of people during the day but could still use help in the evenings.) I also signed up to help get the vote out for Obama on Monday, since nothing can be assumed about red states and blue states given the likely problems in voters reaching the polls in light of the storm. Now, more than ever, we need a President that believes in global warming . Don’t knock yourself for doing nothing more than offering up your shower. Even if no one takes you up on it, it’s the small things that count too. Even just listening to a friend kvetch or letting them know you are there goes a long way. As far as what else we can do here on the UES, I read that Carl Shurz park, located right off of the FDR drive which flooded over, is mobilizing volunteers. I know you and Pam have volunteered there before, so just wanted to mention it. Having just returned from a trip to Haiti, I will say that while many are right to question why it is taking so long for “them” to restore power to certain areas – people in Haiti have no one to turn the power on for them. Many of them have no power to start with. The fact that the subways and buses are back up, our stores have food, the bags of junk we have tossed out of our apartments this week are being picked up by sanitation trucks and we can watch Mayor Bloomberg, Governor Cuomo and Governor Christie call out the utility companies on our televisions or the internet speaks volumes to how lucky we are to live in this country, despite the daily hassles doing so entails. I have been chronicling my thoughts over these unprecedented days in NY on my blog, http://www.jamikellywriter.tumblr.com and will continue to report in from the shelter and the Obama trail over the next few days. Details of my trip to Haiti can be found there as well. For those of you on the Upper East Side, a collection site has been set up in front of the Post Office on 85th Street, between 2nd and 3rd Avenues. Donations are of all types are being collected including cleaning supplies, electric blankets, hand warmers, work gloves, rubber gloves, batteries, flash lights, coats, baby wipes, diapers, water and any other supplies anyone can provide besides clothing. Volunteers are also needed to sort all the donations, box them and then help to load them onto donated trucks which will deliver all items those areas in need. Volunteers will be at the site today until 4pm. In addition to making a donation, my family helped out for a number of hours yesterday and will return again today to help out and it made us feel like we were doing something to help out those who were not as fortunate as we were.